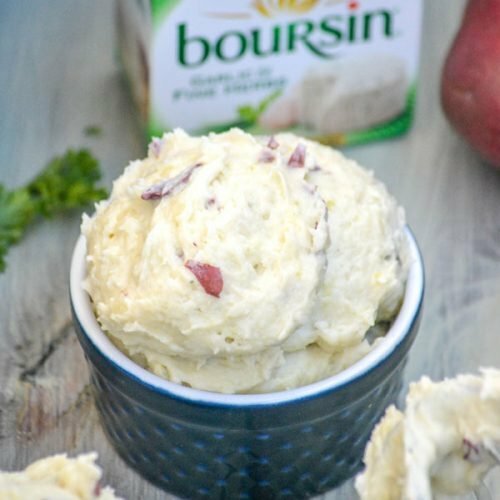 If you thought you loved mashed potatoes before, give these Whipped Boursin Cheese Mashed Red Potatoes a try and be prepared to fall into a whole new level of love with the classic side dish. These are pure comfort food, perfect for dinner when served with virtually any meaty entree. Mashed potatoes are one of the best culinary inventions of all time in my opinion. They’re a staple in our home. You’re guaranteed to see them at every. single. holiday meal. Who knew, how did they know, they could mash up boiled softened spuds and that when whipped with a little cream, butter, and salt- magic would happen?! While potatoes themselves are native to the Americas (shocker to many, myself included), Europe kinda perfected them once they were introduced by the Spanish. They became a staple of the frugal since they’re so versatile. They can fill out just about any dish. They’re the perfect vessel for so many different flavors, ingredients, and ideas. While I love a good loaded baked potato, like our Tex Mex Twice Baked Taco Potato or our Crab Stuffed Twice Baked Potato, there’s so much more out there to do with them. We’ve used them in bread to make these soft & oh so fluffy Cheddar Potato Pull Apart Rolls. Summer side salads are incredible thanks to potato salads like this Dill Pickle Potato Salad, or even our Warm Mustard & Herbed German Style Potato Salad. Don’t even get me started on the soups. Oh the yummy, yummy possibilities! 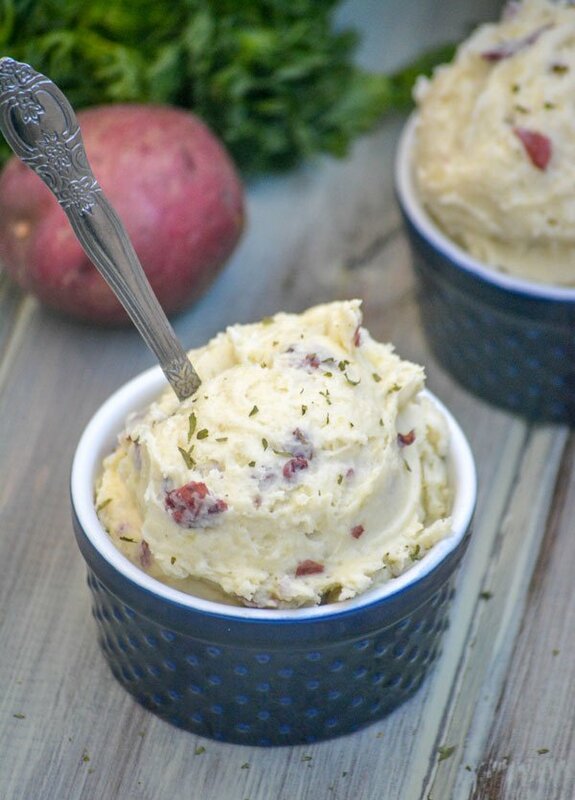 But my all-time favorite way to enjoy the potato is in it’s simplest form, the humble mashed version. 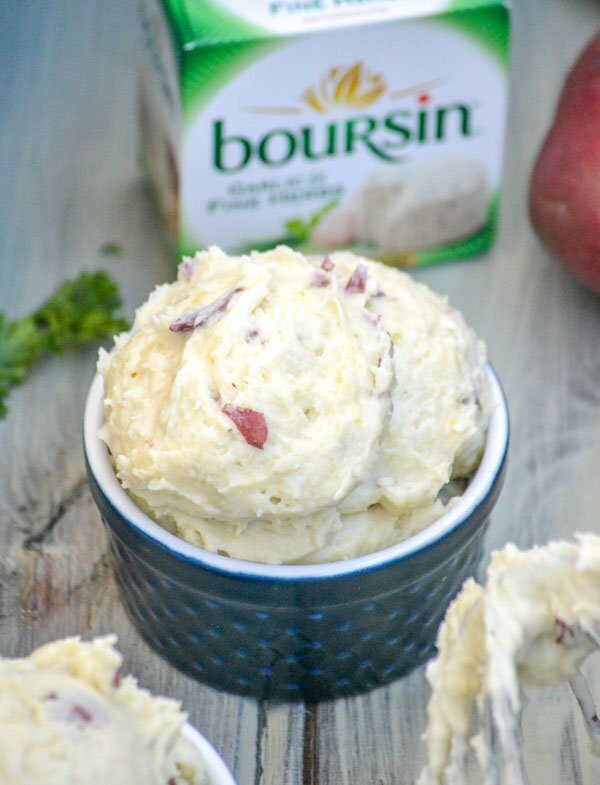 Even that can be done so many different ways, like with these Whipped Boursin Cheese Mashed Red Potatoes for example. The first thing to consider when making mashed potatoes? Using the right kinda of potatoes. Not all potatoes yield the same results. The best ones are Russet, Yukon Gold, or Red potatoes. 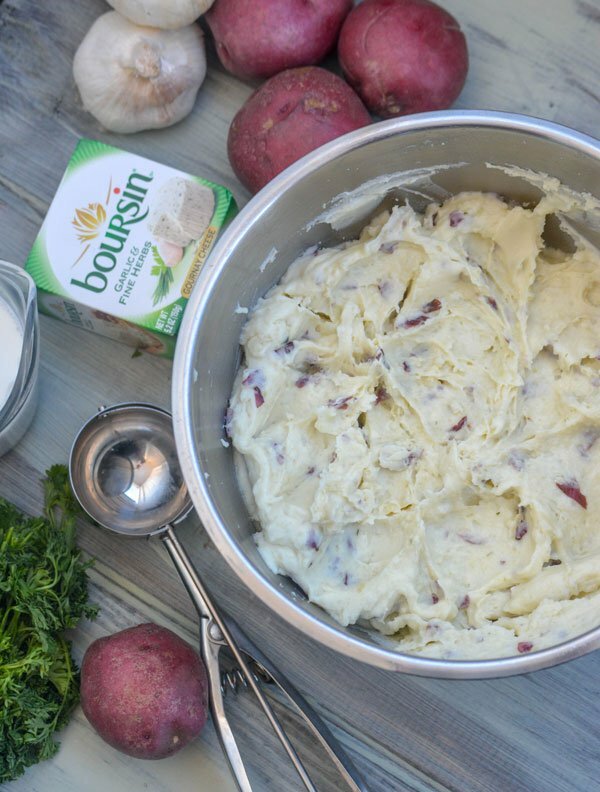 For this recipe, and for many, we opt for red potatoes because we prefer to leave the skins on for nutrients/textures sake, and they never fail to make a pretty presentation. Next on the things to think about list, oddly enough, is how you’re going to mash your taters. Believe it or not, but their is such a thing as over mashing/mixing. You’ve got to be careful because over mixing can happen easily and quickly, and that will yield ‘sticky’ potatoes from releasing too much starch. We want fluffy potatoes. So we tend to lean towards the old fashioned, by hand with elbow grease method. If we’re going for whipped potatoes, like we did here, I advise mixing ‘just’ (heavy emphasis on that word) until you get the consistency desired. 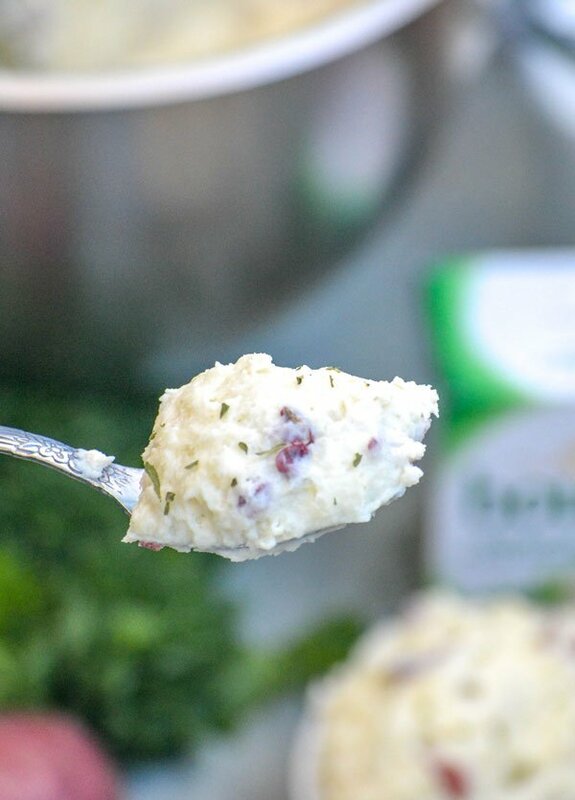 Silky smooth potatoes, whipped just to perfection, these Whipped Boursin Cheese Mashed Red Potatoes get a gourmet flavor infusion from some fancy garlic & herb specialty cheese. They won’t break the bank, but they sure will taste like you pulled out all the stops. Serve them with any dinner meant to impress, or wow a crowd at any holiday meal. You simply can’t go wrong however you choose to enjoy them. 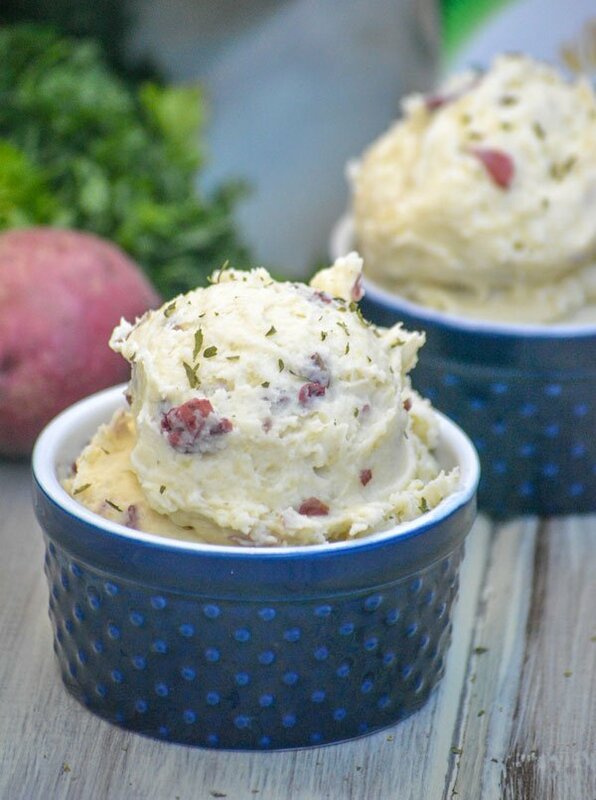 A rich, creamy mashed potato recipe that saves time by skipping peeling, and is made on a budget but will transport your taste buds to a 5 star restaurant. Add the potatoes to a large pot, cover them with cold water. Bring the water to a boil, reduce the heat until simmering, and cook the potatoes until tender- about 15-20 minutes. Drain the potatoes and then transfer them to the bowl of a stand mixer. Add the butter to the potatoes. Using the whisk attachment, whip the potatoes for 30 seconds. Pour in the half and half, and whip JUST until the potatoes are almost completely smooth. Use a spatula to fold in the Boursin cheese until completely incorporated. Salt & pepper, to taste. Scoop the mashed potatoes into bowls, or onto the desired serving plate. Sprinkle with the parsley, and serve immediately.